Thunderboltを介しMacのEFIを書き換え、マルウェアを潜ませるThunderstrike手法に、更に他のMacへ感染を広げることが出来る「Thunderstrike 2」が公開される。 | AAPL Ch. When another machine is booted with this worm-infected device inserted, the machine firmware loads the option ROM from the infected device, triggering the worm to initiate a process that writes its malicious code to the boot flash firmware on the machine. If a new device is subsequently plugged into the computer and contains option ROM, the worm will write itself to that device as well and use it to spread. […] “People are unaware that these small cheap devices can actually infect their firmware,” says Kovah. 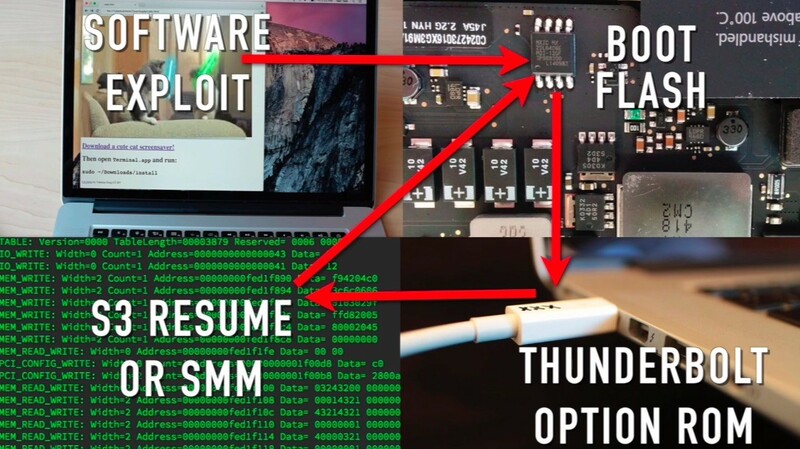 Kovah and Hudson have notified Apple about the Thunderstrike 2 vulnerabilities, but thus far, Apple’s only fixed one of five security flaws and introduced a partial fix for a second. Three of the vulnerabilities have not yet been patched, but it’s likely Apple is working to get the flaws fixed in an upcoming security update.